This was the first time that I have ever been to Costa Rica and I loved it! Sam ended up finding a great house in Nosara on Air Bnb that we stayed at with three of our friends. The thing that is awesome about lodging in this area is that you can find it really cheap! Which kind of makes up for the expensive eating out food and drink costs. But you can literally find a whole casita for yourself for $50/night. How cute is this little place for a romantic getaway for two? But you’ll want to look well in advance because when Sam booked everything was full! We still managed to find this sweet listing. A lot of the hotels in Nosara also have a variety of options for every budget from one room rentals to whole houses to in-between and hostels. Check out Kaya Sol , The Guilded Iguana , and Casa Romantica . 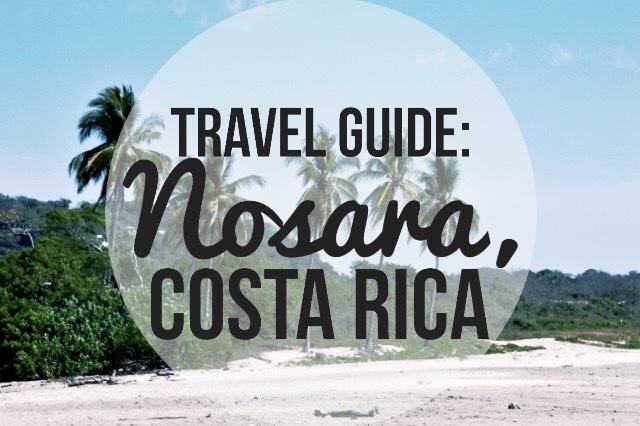 We stayed in Nosara, literally right up the hill from Guiones – the cutest little town with lots of restaurants, shops and the best surf in the area. So we literally got up in the morning around 5:30, drove down the hill to Playa Guiones and went for a morning surf pretty much every day! If you need to rent a board, check out Juan Surfo’s on your way to the beach! And don’t forget to go for a sunset paddle because it’s a lot of fun! Everyone grabs their boards and heads to the beach around 4-4:30 to surf, hang out on the beach with a few drinks and watch the sunset. It’s really great! The first two days we were in Costa we went exploring in nearby towns. All with pretty beaches and towns with restaurants and shops pretty similar to ours, though I thought Guiones was much more quaint. It had a lot of cafes, fresh pressed juice bars, and spas and everything that you could want to enjoy, so the rest of the week Sam and I rented a four wheeler from Iquad and enjoyed Guiones while our friends explored the other towns and found some spelunking! If you’re looking for excursions to do for your visit, they have everything! Spelunking, Horse Back Riding, ATV Jungle Tours, Paddle Boarding Tours, Canopy Tours, Helicopter Tours, Deep-Sea Fishing and more. They’ve got it all and if you’re lucky you’ll see a lot of Howler Monkeys! Check out the top things to do in Nosara on Trip Advisor. We also hung out at the Solo Bueno a couple of times (used to be a hostel and is now only a restaurant and bar with a pool). Friday night they had a Reggae Concert (the Talawa Reggae Army performed) and Saturday we took a break from surfing to enjoy their pool, some drinks and a brownie sunday. Walking around the abandoned Nosara Beach Hotel. After surfing we would usually, most days, get some gelato from Seekret Spot! Best gelato in the area! Seriously so good. Then we’d grab a slice of pizza from a road side pizzeria in town. Wish I could remember the name of it because we literally ate there four times! And then we’d have an afternoon coffee break. Cafe Fiore has really good coffee! Try their Nutellino Cappuccino. It literally has scoops of Nutella in the bottom of the glass. Al Chile: Their Applewood Smoked Chicken Burrito was amazing! I ordered some Pulled Pork Tacos and really wished I had ordered the chicken burrito, though my tacos weren’t bad. Their Mojitos were good and we enjoyed some Chili-Guaro’s – a famous spicy Costa Rican shot – that half of us loved and half of us didn’t. I thought it was interesting but good. You’ve got to try it for yourself! An authentic Costa Rican Soda Cafe & Bakery: You’ll see these Soda cafe’s in every town. We all enjoyed some yummy fresh juice and homemade caramel bread before we ordered our combo lunches. Some of us had burgers, some of us had sandwiches and wraps and only one of us ordered the Authentic Costa Rican lunch. It had a meat of the day (pork chop), rice and beans and veggies. Kaya Sol: Sam and I ordered: Jungle Patacones – Deep Fried Plantains served w/Black Bean Dip topped w/Cheese & Diced Jalepeño (SOO GOOD), Guiones Salad – Fresh Fish, Steamed Veggies, Lettuce, Tomatoes, Avocado & Beets w/ miso ginger dressing, Taco’s de la Casa – Choose Chicken or Fish. Served w/an arrangement of Avocado, Cheese & Fresh Salsa. and a Passion Fruit mojito and margarita. The fish was really good and super fresh. El Chivo: We ate here on our last night! It’s over in Playa Pelada, about a five minute drive away. The service was great and the atmosphere is really fun. I ordered a Burrito Grande Supreme and it was the best order, in my opinion! It was so big that I was able to save half of it for breakfast the next morning! The passion fruit margaritas were also really good and a nice size! Beautiful pictures! Looks like you had a great time – I totally understand wanting to be there still. Post- Costa Rica blues is a real thing.